In the previous article, we were enlightened about Belgian Chocolates by L Nitin Chordia. Today, we’ll see the Trends and Innovations in the premium segment of the chocolates industry as seen by chocolates expert, Nitin. Today, chocolatiers have gotten extremely innovative. Most of the innovation happens with Home-made or Premium chocolates. 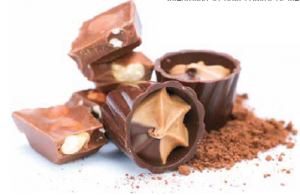 Pralines with caramels and hazelnut creams, which are traditional favourites, remain the bestsellers, but flowers, fruits, spices, coffee, teas, and even some savoury fillings like chilli peppers, cheese, tomato-basil and wasabi find place in some lip-smacking Belgian pralines! Apart from the fillings, chocolate made from beans of a single origin or a combination of rare origins combine with the fillings and add to the specific flavour notes of the final product. Bean-to-Bar and Tree-to-Bar Chocolatiers – Chocolatiers are backward integrating to gain control of the farms where cocoa beans are grown in order to preserve the flavour, and are processing the beans themselves to gain control over the entire process. Chocolatiers are truly able to differentiate by offering their very own chocolates. Single Origin and Varying Cocoa Content: Chocolate makers have also started to focus on specific palate requirements. Each ‘origin’ chocolate is dedicated to the beans from one single region (not a plantation). Just like in the case of grapes used in wine and beans used in coffee, cocoa beans from specific origins often reveal floral, grassy, woody, herbaceous or fruity flavours and aromas that are refreshing and unique at the same time. Even from within the same region, chocolate with varying percentages of cocoa content further adds to the interesting possibility of creating something unique, as the chocolatier adds similar or complementary fillings or infusions into the chocolate. Real Origin Chocolates: These are chocolates that are made with cocoa beans sourced from a single plantation in a region. Chocolate lovers are able to appreciate the taste and offerings from each plantation over a period of time. physically extracted and used to sweeten the chocolate, thus providing a healthier and more flavourful option to the chocolatier and the chocolate lover. Finally, the rest of the world may have failed in shipping Zero Defect products, but Chocolate maker Barry Callebaut has recently introduced cocoa with as good as zero defects and zero off-flavours, with pure intensity. This promise of true flavour / intensity helps chocolatiers get the maximum out of their innovations.